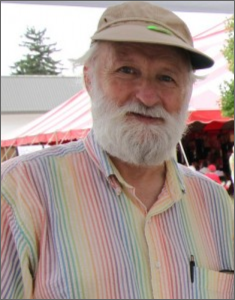 The award is presented annually to a graduating high school senior in the mid-Michigan area in memory of Tom Schneider, a local activist and Bath Township Supervisor, who touched every life he encountered, in our community and around the world. Tom was involved with the Abrahamic Community, Haven House, Peace Education Center, Bath Township Recycling Group, WKAR Radio Talking Book, Great Lakes Folk Festival, Habitat for Humanity, Looking Glass Community Services, Saint John’s Student Parish, and many other volunteer efforts throughout mid-Michigan. He died in the prime of his life on December 8, 2011. The award honors the memory of Tom Schneider, who gave so much of himself to make our community and our world a more peaceful one. 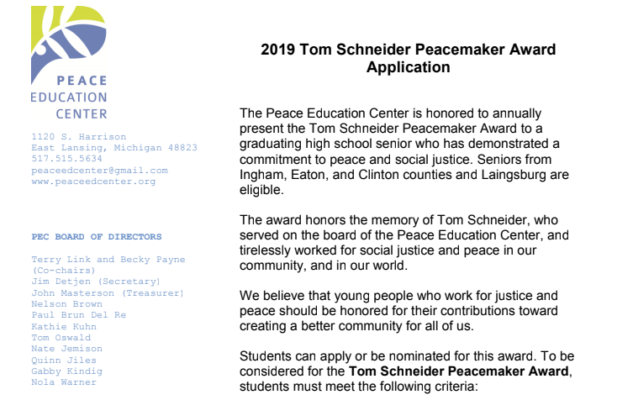 Like Tom, who served the Peace Education Center (PEC) as a board member and volunteer extraordinaire, the PEC believes that our young peacemakers deserve to be recognized for their contributions toward a better world for all. We are honored to support this award in Tom’s name.